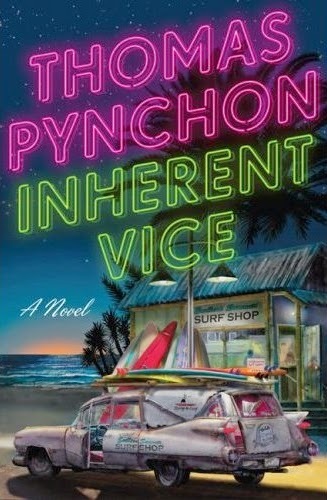 Like E.L. Doctorow's Ragtime (1975), Thomas Pynchon's 2009 detective pastiche Inherent Vice is a hip and hefty comic riff (only with a melancholic bedrock) that builds on pop connections and associations already alive in the reader's mind. In Ragtime, a parable of American lore in which the author performed masterful tricks with the history we thought we knew, Doctorow captured the spirit of America in the era at the turn of the twentieth century and World War One. But rather than write a realistic account of the period, Doctorow created a crazy quilt, and a flip-book chronicle that was, in many ways, already a movie before it became one. Inherent Vice is equally opulent, but given that it invokes America in the early Seventies when the heady counter-culture of the Sixties is decimated by assassinations, drugs, and the election of Richard Nixon as President, it is perfumed in regret and loss. There's also a sense of dread implored, too, as the story opens in Los Angeles on the eve of the Manson trials (where Charles Manson, a diabolical psychopathic drifter, who looked like a hippie, had colonized the same California girls Brian Wilson once wrote lovingly about a few years earlier and together Manson and those women committed mass murder). Inherent Vice is about the door starting to close on the communal utopia the Sixties promised. Drawing upon the combined sensibilities of Raymond Chandler, Ross Macdonald, Roger L. Simon (who introduced the first hippie detective, Moses Wine, in 1973's The Big Fix), James Ellroy (minus his strychnine cured cynicism), the Coen Brothers's The Big Lebowski (1998), Robert Towne's stories for Roman Polanski's Chinatown (1974) and Hal Ashby's Shampoo (1975), and the zapped underground comics of Gilbert Shelton's The Fabulous Furry Freak Brothers, Pynchon fashioned an affectionate accounting for the psychedelic day about to pass into a psychotic night. Set in fictitious Gordita Beach, Larry "Doc" Sportello is a private investigator and a proud pothead who is lost in the cannabis fumes that decorate his already wistful demeanor. One night, he receives a visit from his former girlfriend Shasta Fay Hepworth, a dreamy hippie girl whose desires for hedonistic freedom have now turned as expedient as Julie Christie's Jackie Shawn's did in Shampoo. Having had an affair with the real-estate mogul Mickey Wolfmann, Shasta wants Doc to help prevent a plot allegedly hatched by Mickey's wife Sloane and her lover, Riggs Warbling, to have Mickey admitted to a mental health institution. From there, Inherent Vice (a phrase that refers to a hidden defect, or the very nature, of a physical object that causes it to deteriorate because of the fundamental instability of its components) introduces a plot as labyrinth as Chandler's The Big Sleep (1939), where Doc encounters members of George Jackson's Black Guerilla Family, a rock musician once thought dead from a heroin overdose who becomes a government informer on subversive activities for a gang of right-wing goons known as Vigilant California, and a sinister schooner known as the Golden Fang, which houses a criminal network of drug trafficking that will ultimately define and permeate the junk bond era of Reagan's Eighties. He also has to deal with his doppelgänger in the form of an old LAPD nemesis, Detective Christian "Bigfoot" Bjornsen, a straight-arrow cop with a flat-top hairdo out of Jack Webb's Dragnet, but with an unconscious and disturbing oral fixation on food. Everybody's looking for instant gratification in a culture where pleasure is now coming in short supply. Since Inherent Vice has all the devilish embroidery of a contemporary noir, the novel is naturally steeped in movie lore with Doc casting himself as a modern-day John Garfield who continually puzzles his way through the elliptical movie plots of Val Lewton's uncanny B-horror pictures like I Walked with a Zombie (1943). But what holds the strands of the novel together, despite the endless story twists and outrageous characters that turn up, is Pynchon's continual turns of phrase. His madcap dialogue cleverly distills the aroma of a language once used as a portal to paradise, but has now (for its characters) become a harbinger of a dead-end life in waiting. The hip talk that had bound a culture together as easily as the joints passed around and shared now arouses suspicion, isolation and deception. As the narrator of the story, Pynchon sets this encroaching paranoia in the context of whimsically comic descriptions of ideals that are drifting away and contrasting them with what is now being settled for. He identifies strongly with Doc's fears that "the Psychedelic Sixties, this little parathesis of light, might close after all, and all be lost, taken back into darkness." But he's not foolish enough to take nostalgic refuge in that sentiment because he knows that its romantic naivete provided the hand that "might reach terribly out of darkness and reclaim the time, easy as taking a joint from a doper and stubbing it out for good." Inherent Vice, like Robert Altman's sly revision of Chandler's The Long Goodbye (1973), stays true to the romantic spirit of the detective's moral universe. Also, like Altman, Pynchon dispenses the nostalgic notion of the detective's code of honour being adequate to the task, by showing its inadequacy in a world where velvet paintings can depict "a Southern California beach that never was – palms, bikini babes, surfboards, the works." 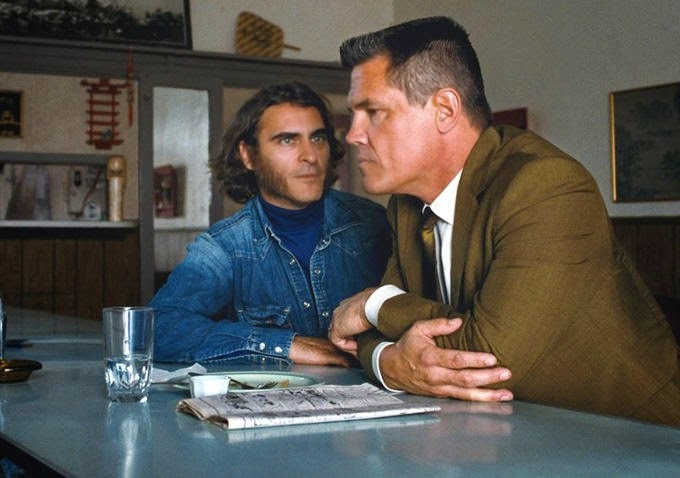 Joaquin Phoenix and Josh Brolin in Inherent Vice. In Paul Thomas Anderson's faithful adaptation of Inherent Vice, which takes in most of the plot with very minor changes made to the narrative, he puts a lot of love and dedication into weaving its disparate strands into a coherent story. Unlike The Master (2012), There Will Be Blood (2007) and Magnolia (1999), where his rigorously stylized and self-consciously obsessive need to remove storytelling from the particulars of dramatic motivation provided incoherent abstraction, Inherent Vice doesn't create its own cinematic desert island. Film technique isn't a fetish at the expense of sense and sensibility here. With a self-effacing humility, Anderson enters Pynchon's universe – with its own maddening abstractions – and gives himself over to the material. In one early close-up shot, where Doc (Joaquin Phoenix) is lying on his sofa measuring the miles between his thoughts of the past and the ones that occupy the present tense, Anderson beautifully adduces a loss that can't be gathered with a desire for clarity that can't be found. When Doc's past (in the form of Katherine Waterston's Shasta) then waltzes through the door like a mirage out of his memory finding celestial form, Anderson sets just the right tone that marries his own obsessions about those desperately seeking control with Pynchon's irreverent take on the paucity of that desire. But because Paul Thomas Anderson's weakest hand is his dramatic one, he can't lift the material beyond creating visual and musical flourishes that propel the plot. Anderson gives us the story, but he can't unravel the mysteries that permeate it. For a director who has such a dynamic visual presence, as There Will Be Blood and The Master surely demonstrated, Anderson's biggest deficiency is in his inability to give over to the dramatic conflicts that his characters possess. Unlike Orson Welles in Citizen Kane (1941), or John Huston in The Treasure of the Sierra Madre (1948) or The Man Who Would Be King (1975), who used film technique to free themselves in order to plunge into the possibilities – and dangers – of losing control, Anderson's own vice for control is inherent in just about every picture he makes. As a result, he can't identify with the urgent maniacal drive in Daniel Day-Lewis's oil entrepreneur in There Will Be Blood, but instead reduces him to a single-minded tyrant that leaves him with no tragic dimension to match his teeming avarice. It's as if Anderson were making an epic tale of American betrayal that implied that there was actually no American Dream to breach since it was already a nightmare to begin with. (This view conformed perfectly to those already disparaging American culture in the Bush period.) There Will Be Blood may have been epic, but it was puny in scope and with barely a moment of dramatic plausibility. The Master also had its characters in the vice of a power struggle, where war trauma and alcoholism met cultish megalomania, but Anderson again abandoned creating dramatically distinct and coherent portraits of dysfunction. He preferred to make broader behavioural statements that turned into abstractions of deviant human behaviour. (If Anderson were a clearer dramatist, he would have understood that Philip Seymour Hoffman's cult leader would have never picked the psychically damaged Joaquin Phoenix to represent his cause given its controversial ideas.) Magnolia was supposed to be about the serendipitous connection between random events, but instead Anderson willfully fit together stories that made little dramatic sense as a tapestry –.and with characters that were even less plausible such as Tom Cruise's TV self-help misogynist whose methods for dating wouldn't ever be successful let alone allowed on the air. With Inherent Vice, Anderson doesn't exercise that claustrophobic need to hem everything in since the culture is already doing that to its characters. But he does little to vary the dramatic tone and open up the vibe of the period after that stunning opening scene. The picture seems to take place in a fugue state, like the characters themselves, and where we follow the plot strands, but don't feel the connections between the events and the people that these events are happening to.You barely catch wind of the impact of the Manson trial, despite it being mentioned, or the shadow of fear it cast over the community and the counter-culture. And the book's jokes don't uncork the paranoia but seem part of a stoned cartoon universe where all human activity is reduced to stasis. 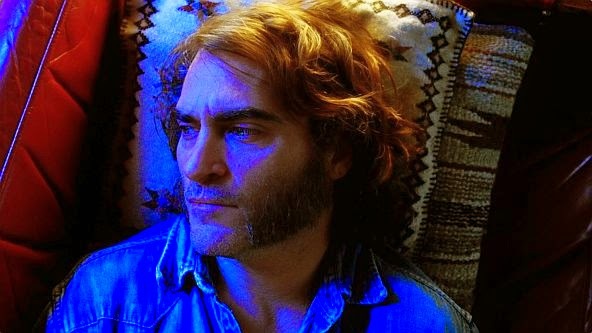 As accomplished as Joaquin Phoenix is as Doc, he doesn't portray him as a perpetually stoned detective, medicating himself due to the pain of loss, and who is struggling to see through the pot smoke. Instead, he's like one of Gilbert Shelton's Furry Freak Brothers continually taking refuge from reality which defuses what's at stake in the story. Speaking of cartoons, Josh Brolin's Bigfoot is no more than an outsized Fred Flintstone pounding Doc as if he's Barney Rubble, a pal he has to periodically beat sense into. Katherine Waterston creates a delectable dream image when Shasta first walks in the door on Doc, but the languid tone of the picture keeps Shasta in the fog as if she's a continually forgotten plot point. 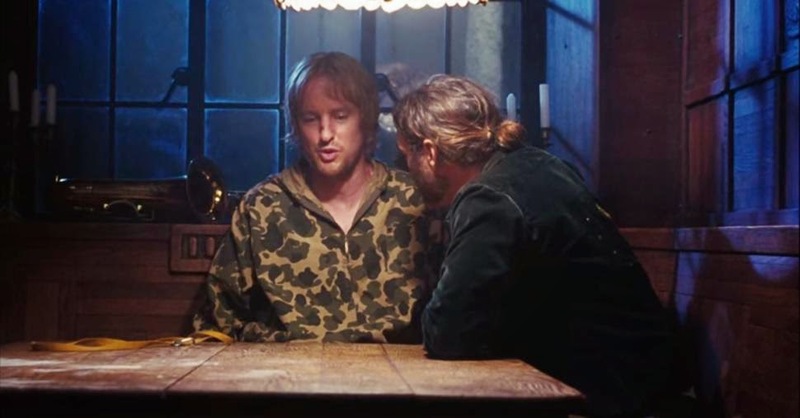 Owen Wilson is absolutely right to be playing Coy Harlington, the heroin-addicted surf rock musician who is presumed deceased, but right is about all he gets to be. Even one of the best lines in the book, when Coy tells Doc that while turning up in his old band again, he was unrecognized ("Even when I was alive, they didn't know it was me"), Anderson doesn't give the line its due, but lets it fall flat like a stoned aside. Martin Short turns up as a quack physician who serves only to remind you of Henry Gibson playing a similar character in The Long Goodbye. Reese Witherspoon as Doc's current girlfriend, Penny, the Deputy DA, is one of the few who rises above the din to create a lively comic presence. She is a bright bulb that lights the picture. Anderson also smartly introduces a minor character Sortilège (Joanna Newsom), who acts as narrator to integrate the lyricism of Pynchon's prose. Owen Wilson as Coy Harlington. It's rare to find a movie that is so faithful to its source as Inherent Vice is, but it also goes to prove that narrative fidelity isn't enough to make a great film. Pynchon's shaggy-dog procedural indeed makes perfect movie fodder and it may have gotten under Anderson's skin reading it. But in a career so busy making obsessive films about insulation, Anderson's lavish attention to the book feels remote and opaque rather than one that shook him loose. Pynchon's novel left me feeling high and laughing at the looming darkness he depicts and parodies, but Anderson's film is a druggy spectacle lost in a purple haze of good intentions. And it only left me with a bad case of the munchies. 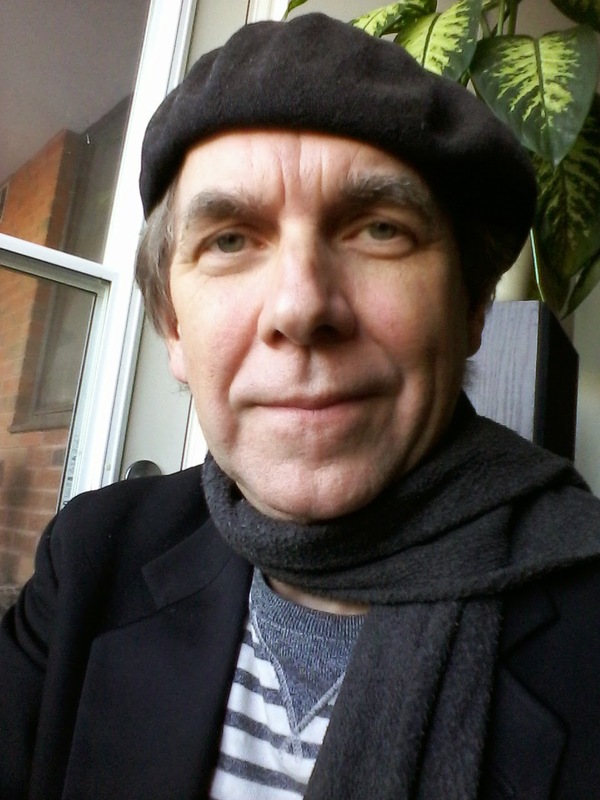 – Kevin Courrier is a freelance writer/broadcaster, film critic and author (Dangerous Kitchen: The Subversive World of Zappa, Randy Newman's American Dreams, 33 1/3 Captain Beefheart's Trout Mask Replica, Artificial Paradise: The Dark Side of The Beatles Utopian Dream). Courrier teaches part-time film courses to seniors through the LIFE Institute at Ryerson University in Toronto and other venues. His forthcoming book is Reflections in the Hall of Mirrors: American Movies and the Politics of Idealism.